Why would the proposal ban over 95 % of semi-auto firearms and cost over a billion EUR? How difficult it really is to convert a modern semi-auto rifle to a full-auto. What solution would fulfill EU goals and avoid the mass ban and expropriation of firearms alongsidewith associated extreme costs? How the wording of the Proposal implies that half of EU citizens would have suddenly been turned into criminals. European Commissioner Mrs Jourová has been misinformed that the proposal only bans “assault rifles with a rate of fire of 800 shots per minute”. This boils down to a profound misunderstanding in categorization of firearms. Thus, it is necessary to first distinguish between the semi-auto and the full-auto. In fact, the difference is quite simple. With full-auto firearms, it is sufficient just to hold the trigger and the automatic mechanism of the gun will ensure that it shoots automatically, like a machine gun, until the magazine is empty. However, these (full-auto) guns are already strictly prohibited in the EU, and have been for the past 25 years – since 1991, when the EU released the first binding directive about firearms. Despite this, a lot of MEPs seem to have no awareness about such documents or distinctions. If a modern firearm is a “semi-auto”, it can – by design – only shoot as fast as a revolver (see Fig. 1). Upon a trigger pull, a revolver “loads” the next cartridge by rotating the cylinder. Another trigger pull is necessary for “loading” the next round. Likewise, a semi-automatic firearm only loads the next cartridge after a separate trigger pull – the only distinction between a revolver and a “modern” semi=auto is that instead of rotating its cylinder, a semi-auto loads cartriges by the movement of its bolt and from a detachable magazine. Regardless of the particular technical solution, this applies consistently for each semi-automatic gun: before the next shot is possible, it is necessary to release the trigger and then pull it again. After a shot is fired, the hammer is cocked by the recoil of the bolt. To keep the hammer cocked, however, it is necessary to catch and hold it in the cocked position. Otherwise, the firearm wouldn't be able to discharge the next round. This is done by the so-called disconnector (yellow in illustrations). The disconnector engages the hammer by its cog and locks it in the cocked position independently of the trigger. However, in this condition, it's physically impossible to fire the next round! The hammer, locked by the sear (the claw of the disconnector), has no contact with the trigger at all (orange / red in illustrations). Therefore, the hammer cannot be released by the trigger. And hence, the gun cannot fire – see Fig. 2. Only after the trigger is released would the disconnector's sear let the hammer go and yield its control back to the trigger – see Fig 3. Only then, another trigger pull can again release the hammer and fire one more single shot. It is not technically possible to fire sooner, before the trigger release takes back control of the hammer away from the disconnector and gives it to the trigger – see fig. 4. After the shot, the hammer returns back control to the sear of the disconnector; and the whole cycle repeats itselfand again, before the next shot, it is once more necessary to release the trigger. One wonders; might it be sufficient then to file away that disconnector, thus converting a semi-automatic firearm into a fully-automatic firearm? No, that wouldn't work. To fire the gun, the hammer must be thrown at the cartridge's primer with sufficient speed and power. If someone files away the disconnector, the hammer would have not been caught at all in the cocked position. Instead, it would follow the returning bolt, being slowed down by it. Therefore, the hammer would not have sufficient speed and energy to fire the next round. Filing away the disconnector would, therefore, render the weapon unreliable or even completely unable to fire. No one wants to own an unreliable firearm; we will go through this in more detail below. The second blunder is the claim that the Commission does not seek to ban “all“ semi-automatic firearms, only those “very dangerous” ones which can be “easily” converted to a fully-automatic capability. Alas; the EU Commissioners did not make a Directive banning some very dangerous firearms only. Instead, in its section 6 — it strictly prohibits acquisition and possession of “civilian semi-automatic firearms converted from those having an automatic mechanism,” and — section 7 —all firearms which “resemble” automatic weapons are prohibited. Experts are rightly concerned, for about 99 % of all semi-automatic firearms would be covered under these two vague points – it would even include service pistols of municipal police officers. The most absurd and dangerous point is the prohibition of firearms “resembling” there automatic versions, the so called ”B7“ category. At present, this category is completely superfluous, for all these firearms fit a different B-level category (e.g., B1). But if firearms “resembling automatic versions“ were to be moved from a B-level category ”requiring permit“ into the A category – which means “prohibited“ –, it would be necessary to review which firearm models are now covered by the vastly-expanded A category, and thus will be prohibited and expropriated, and which ones would still remain in the B category. This is the catch that would prohibit 99 % of semi-automatic firearms. For almost every semi-auto rifle or pistol, there is at least one prototype or rare model which stems from the same concept and therefore looks the same or almost the same — but is a full-auto. By this Directive, that would automatically imply a prohibition of the original, semi-auto-only model. Examples of this are, among others, Glock 18, CZ 75 Auto, Beretta 93R, Grand Power K105R.... There is even a full-auto prototype closely resembling the legacy Colt model 1911 pistol; which was experimented on by Colt in the 1930s: thus, even 1911’s would become prohibited! Fig. 5 gives a comparison. 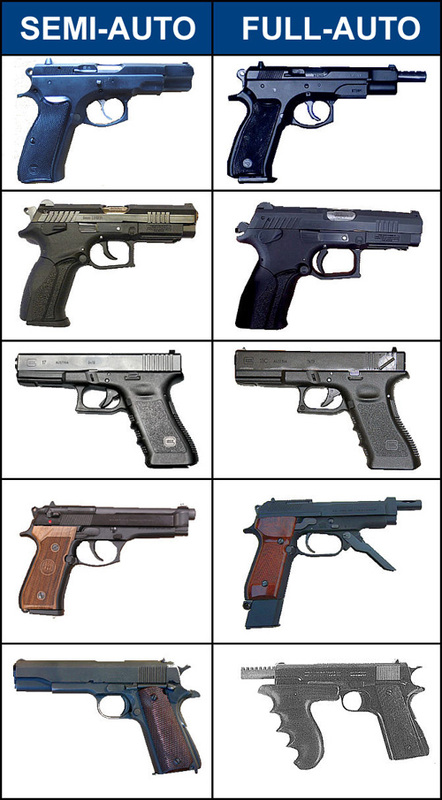 The left column contains the original semi-automatic pistols, the right one shows their automatic versions and prototypes. Are the pistols on the left “very similar“ to those on the right? Yes they are. So the new rules would make them all prohibited, although they have been with us ever since 1910; and although until now, they have been banned only briefly during the Nazi and the Communist regimes. Moving the firearms currently within B7 category into the A category would imply instant and total disarmament of all men and women who shoot competitions using the CZ 75 pistol e.g., at the World Championships; all who possess a Colt 1911 in a collection or perhaps to defend themselves and their families; even those who carry a Glock on duty as municipal police officers. All this is happening because the European Commission blindly adopts false, irrational and emotional “arguments“of some “gun control” pressure groups; who try to misuse Commissioners and MEPs as their tools, who will unknowingly endorse prohibition of 99 % semi-automatic firearms including pistols, and who then will take the blame. Trick no. 3 – what does “easy conversion back to automatic” mean“? Should the Member States reject this outright insane draft to move the B7 category firearms into the”prohibited“category A on the grounds of their appearance, the proposal contains a back-up plan. Section 6 would ban almost all semi-automatic rifles, regardless of their looks, due to the prohibition of “civilian semiautomatic firearms converted from automatic“ firearms. Let us consider first which semi-automatic long guns sold and used for sport and hunting purposes would not be covered by this definition – and consequently – prohibition. Most of shotguns would be out of danger. Among rifles, only a couple of very old ones, such as the Soviet SKS made in 1944, the French MAS of 1949 or the Czechoslovak rarity, Vz.52 rifle, wouldn't be banned. However, almost all other semi-automatic rifles would be prohibited. Why so? With a few notable exceptions (such as Benelli MR-1, based on M4 shotgun, or plastic Kel-Tec rifles), the turn of 1940s and 50s saw the stop in design of solely semi-automatic rifles. When designing a new semi-automatic rifle, every arms manufacturer hoped it could also succeed in army tenders. Hence, they designed the new rifle so that it would be possible to manufacture both, the automatic army rifle and civilian semi-automatic version, in one production line, just to reduce production costs. Might this mean that all these civilian semi-auto versions could be”easily converted back to the automatics“, as the Commissioners are afraid of? The answer is again “no”; for a vast majority of modern rifles. But to understand this, the Commissioners would first have to understand firearms design as well as you would after reading the following pages. All modern semi-automatic rifles shoot from a “locked bolt“; this means that the bolt inserts the cartridge into the chamber and locks it, but does not fire it. In order to fire, the firearm must therefore be equipped with an additional independent firing mechanism; so as to work reliably and safely. For this reason, such a firearm by itself intercepts the hammer at the end of the semi-automatic cycle, thus preventing automatic fall of the hammer. In order to shoot, a shooter has either to release the trigger and then to press it again…or the firearm has to be outfitted with some extra device to enable the automatic operation. Yet another additional mechanism; this device is called an, auto-sear“, and as it is an additional component, no modern rifle can shoot full-auto without it. Thus, it is quite easy to prevent any possibility of a “fully-automatic conversion“ of a semi-auto. It is simply a matter of a design provision which physically prevents installation of the aforementioned auto-sear into the civilian version. Such a rifle then cannot be easily converted to full-auto, unless one has an adequately equipped gunsmith workshop with capacity to produce a firearm from a piece of proper metal or connections on the black market (this would mean that such an “automatic“ would be acquired illegally, and in that case it is not even worth talking about regulation). What is the auto-sear? It is something akin to a second, independent firing mechanism. When engaged, it disables the regular disconnector and trigger sear. Instead, the auto-sear itself engages the striking hammer and automatically initiates discharge when a special projection on the bolt contacts a cog integrated with the auto-sear. Note that the auto-sear does not work with “civilian” triggers: it only works as a part of a so-called “Fully Automatic Fire Control Group”. Firearms manufacturers for years spared no efforts on their own to ensure that the civilian firearms do not allow installation of the auto-sear, even if it was available – this will be discussed in detail below. Since no modern sport rifle firing from a locked bolt has the capability to shoot in an automatic mode of fire without having the Automatic Fire Control Group, the concerns expressed by the European Commission about “hypothetical conversion options” rendering civilian semi-automatic rifles into fully automatic ones could be solved with ease and elegance if the Automatic Fire Control Group parts were banned. An Automatic Fire Control Group is a military component, not used by any civilian rifle; therefore such a measure would not have any negative impact on the citizens of EU Member States. At the same time, it would make “fully-automatic conversions” plain impossible. But the Commission went exactly the opposite way. They do not concentrate on the auto-sear and Automatic Fire Control Group parts. Instead, it seeks to ban and confiscate almost all semi-automatic rifles in the possession of law-abiding citizens across Europe. Based on the average price it can be estimated that the ban and expropriation would apply to rifles worth over one billion Euros, which should be allocated by Member States in their respective budgets. This inevitably begs the question: why has the Commission decided to sanction law-abiding citizens for respecting the law, cause considerable damage amounting to billions, and to destroy hundreds of companies through a blanket ban of firearms, when there is an elegant alternative to regulate military material with zero negative impact? A year ago, the European Commission undertook an”expert report“on firearms. This report was prepared by university professors and commercial analysts lacking any knowledge of firearms design, who assumed the opinions on firearms design by repeating arguments they found on the internet. There, they came across a video, where an officer of the Suffolk police district shows how an illegal, Automatic Fire Control Group component, when combined with the military version of the AR-15 rifle, makes it possible to shoot in the fully-automatic mode of fire. That, however, is absolute nonsense. The subject video does not show any actual “conversion”. The police officer has used two different firearms, one with civilian components and another with military, illegal components. In fact, he just demonstrated how one particular and for that matter illegal component works. The sequence which took the “one minute” mistaken for “conversion time” was actually a routine disassembly of the firearm, during which the officer swapped between the two basic AR-15 components. The resulting rifle consisted of a legal, civilian component, combined with a component of other, this time military AR-15 rifle, to which illegal, fully automatic components were installed and adjusted. Lower receiver (red), housing action spring, magazine, and trigger and firing mechanism. Automatic (military) and semi-automatic (civilian) version of the AR-15 share the same upper receiver because this component itself “does nothing”; it just holds together the barrel, bolt and sights. However, they considerably differ in the lower receiver (including components it houses) and bolt carrier. These differences are described in detail in the next chapter. What is relevant for the video, though, is that the military version of the AR-15, in order to shoot in full-auto mode of fire, needs a special lower receiver designed for automatics (Fig. 7 - illustrated in red), housing so called “Automatic Fire Control Group” including auto-sear and also a special “automatic” bolt (Fig. 7 – illustrated in blue). Such a special lower receiver enabling fully automatic fire is a military use component. Under European legislation such components belong among the so called “essential part of the firearm”, that means category “A“ – prohibited. Note however that from the three components of AR-15 there is one still left: the upper receiver (Fig. 7 illustrated in green). This component has no effect on the modes of fire whatsoever. So, whether the firearm shoots in single shots or in the fully-automatic mode of fire, the upper receiver makes no difference and is common to both civilian and military use. If you have several pieces of these three AR-15 components (upper- and lower receiver and bolt carrier), you can make any interchanges and combinations you prefer. Sport shooters, for example, often have only one bolt carrier and one (of course a civilian) lower receiver and otherwise they use a range of upper receivers with barrels having different lengths and various accessories and sights depending on what competition they are going to shoot (this adaptability is one of the main reasons behind the worldwide popularity of the AR-15 rifles in shooting sports). This “interchange” of those three essential components of the firearm, i.e. upper receiver, bolt carrier group and lower receiver, is what takes that “about a minute” mentioned in the report for the European Commission. But, if you do not have an automatic (military) lower receiver and automatic (military) bolt, you simply cannot create fully automatic version out of civilian components. What has, then, really happened in the aforementioned video? The police officer firstly took the upper receiver combined probably with a fully automatic lower receiver, which however lacked auto-sear (see above and below). So the officer thus demonstrated that if the AR-15 rifle is assembled from the essential components designed for the civilian firearm and/or lacks auto-sear then it has no capacity to shoot in the fully automatic mode of fire, but just in single shots. In the second part of this video he combined the military type of automatic lower receiver with an automatic bolt carrier placed into an entirely different upper receiver than the one shot in the first video – and by this he proved that when you have complete and readily available military-type automatic lower receiver, complete with auto-sear, and to this you insert an automatic bolt into the upper receiver, the result is – without any surprise – an illegal “automatic“, only shooting through a civilian barrel. The police officer, therefore, was not demonstrating that it is easy to convert the AR-15 rifle from civilian, semi-auto, to full auto. Quite the opposite: he demonstrated that if the rifle lacks the auto-sear, it is impossible to shoot the AR-15 in full-auto mode. The subject video was related to a criminal case. More details can be found on the following website http://nypost.com/2013/03/21/sting-nets-li-gun-nut-who-stockpiled-more-than-300-illegal-firearms/ where the police arrested a man who had, at his home, illegal auto-sears called DIAS. The police demonstrated in practice how the auto-sear is of key importance for shooting in automatic mode of fire. The police officer actually made no conversion; he just assembled readily available illegal components of the firearm. Can you manufacture an illegal full-auto AR-15 within 15 minutes? If we now know that the subject video is demagogically distorted and that to make the AR-15 shoot in fully automatic mode, the police officer had to have a special lower receiver designed for automatics with particular parts including auto-sear (discussed in the section “Trick no. 3”) and automatic bolt, someone might wonder – how long would it really take to “convert” the key components of a civilian, semi-auto AR-15 rifle into their automatic counterparts? There is a simple answer – it takes days, or even weeks. First of all, you must find a so called “automatic trigger and firing mechanism“. This is difficult because in most countries of the world, the sale of automatic trigger and firing mechanism are strictly regulated. There you need auto-sear, automatic hammer and also automatic trigger itself. All these parts differ from there civilian equivalents, precisely to prevent easy conversion of civilian rifles to full-auto versions – see Fig. 8. Fig. 8 shows two of differing parts – hammer and bolt (or more precisely bolt carrier; in Fig. 7 it is illustrated in blue). Note the changes in circles. The civilian, semi-automatic versions of these parts do not have a crucial piece of material, because to add missing material is always far more difficult than to remove it. Slightly above is another illustration (Fig. 6), where the hammer is engaged by auto-sear designed for fully automatic fire. Look at it and then again on those two hammers in Fig. 8 and you immediately understand the first difference. The civilian hammer completely lacks cog (circle 1), by which it could be engaged by auto-sear. So if you have a civilian version of the hammer, the rifle will not shoot in automatic mode even if you acquired an automatic sear. The second difference is even more insidious. In the first chapter, there was a mention that someone could be tempted to remove a disconnector in order to make the rifle shoot in full-auto mode. In such a case there would not be anything to engage the hammer in its cocked state, and as the bolt is pushed forward after discharge of previous round, the hammer would follow the forward-moving bolt. Under these circumstances the rifle would not discharge (the AR-15 bolt has design precautions against this), but some designers thought this was not enough. Doubling the security, a recess is fitted onto the hammer (illustrated in circle no. 2). This recess is there to make sure that any experiments with disconnector removal won't pay off and those who would attempt such a thing get punished. On a hammer following the bolt, such a recess would cause the bolt carrier and hammer to get stuck into each other, thus creating a very bad and difficult to clear jam of the rifle mechanism. Finally, the circle 3 (Fig. no. 8) shows the difference between civilian (semi-automatic) and military (full-auto) bolts. The civilian version features a completely milled-off section of the bolt which could activate auto-sear. So if you at best have the full-auto trigger, automatic hammer, auto-sear and yet you have only the civilian bolt carrier, the rifle would still not fire in a full-automatic mode, because the automatic sear would never be activated. Even if you have managed to get all of these parts, you would still be unable to install them into a firearm designed for the civilian use. The ”civilian“ lower receiver (in Fig. 7 illustrated in red) makes it both impossible to choose or select full-auto mode, as there is a factory-made projection on the lower receiver, so that the fire mode selector switch physically cannot be switched to the full-auto position. What is more significant, the civilian lower receiver also lacks a hole for auto-sear pin (any receiver which has such a hole is automatically a category “A” – prohibited – firearm). You would have to drill such a hole, which is really not an easy task as you are expected to make the hole perfectly perpendicular to the axis of the firearm and at the specific and precise spot; otherwise, individual parts of which the automatic trigger consists of would not fit together, making such firearm inoperable. As an alternative to drilling that hole, a variant of the auto-sear called Drop-In Auto-Sear, or DIAS, has been developed. It is installed instead of the traditional auto-sear, but it still requires the Automatic Fire Control Group, automatic bolt carrier and automatic lower receiver installed. Instead of being pinned to the lower receiver, however, DIAS is dropped-in using the upper receiver as a tool. That is exactly what led the police officer from the video referred to at the European Commission Report to a misleading statement about “upper receiver featuring auto-sear“. Remember, placing DIAS into a civilian firearm is not enough to render it capable of shooting in the full automatic mode. Even with the DIAS installed, you still need all of the other automatic parts, which means automatic hammer, trigger, mode of fire selector and automatic bolt with all their differences (see above). On top of that you still need a lower receiver without any device restricting the mode of fire selector. Otherwise, the firearm with DIAS installed is still not able to shoot in the full auto mode, only in single shots. Two at the lower receiver (missing hole for auto-disconnector and featuring a cog blocking selection of auto mode of fire), plus the need to complement all of this by installing an auto-sear, or DIAS. But that´s still not all! Even if you replace the original civilian parts with mix of parts designed for automatic/military use, in order to be able to shoot such rifle in full auto mode without being dangerous to yourselves and suffering frequent failures, you would still have to do a so called “synchronisation“ of the firearm. That means fine tuning of all parts and their springs so that when coupled together they work as a complete system. Without timing the rifle, you would have an unreliable firearm which could explode in your face when fired, which criminals do not want under any circumstances. They know very well that if their firearm suddenly and unexpectedly jams, it could mean the end of their intended crime. If you are not a firearms manufacturer with experts and extensive computer equipment, you cannot calculate the timing. Thus, you have to fine-tune it by applying a trial and error method; and because fully-automatic shooting attracts attention, after each failed attempt to tune the firearms components together, the criminals wouldthen have to wait and find another remote location for their testing. All this would take weeks, maybe even longer, before all parts are synchronised so well and reliably to operate as an “automatic” firearm. As you can see, the conversion process rendering the civilian semi-auto AR-15 rifle into a fully automatic firearm cannot be made within a minute, as absurdly claims the Report of the European Commission, for it is a fairly complicated and a tedious matter. It requires detailed knowledge of a particular type offirearm, access to a wide range of “automatic parts“ and equipment, capacity and skills, time and opportunity to modify the firearm and then to live-fire it until all problems and malfunctions are fixed. Therefore, it is no coincidence that neither terrorists nor criminals bother with acquiring and conversion of semi-automatic firearms to fully-automatic. Aside from the fact that they do not want to attract attention to themselves, it is far more easy and convenient for them to get a complete fully automatic assault rifle on the black market. These assault rifles can be stolen from military forces arsenals or obtained as left-overs from various military conflicts (there is now evidence that Jihadi terrorists in the EU are buying Kalashnikovs smuggled in from former Yugoslavia and Africa by italian maffia, see http://www.thedailybeast.com/articles/2016/03/24/inside-the-mafia-isis-connection.html); however there obtained, they do not need any modifications, timing or expertise and work “out of the box”. Moreover, this once again proves that if the European Commission is truly afraid of a “possible conversion” of legal, semi-automatic firearms into fully-automatic ones, the best way to do this would be to add a single clause to the “A“ category, which would prohibit nothing else but the automatic parts of military weapons. We have just illustrated that without these parts, even such hypothetical conversion is impossible. In the U.S., such a clause has been expressed using this brilliant definition: Parts of the firearms which are designed and intended solely and exclusively for use in converting a weapon into a fully-automatic. This is the only conceivable tightening of EU Directive on Firearms and Ammunition, which would not necessarily result in damage amounting to billions, ruining hundreds of businesses and still cover concerns expressed by EU Commissioners on hypothetic conversion of semi-automatic firearms into those capable of fully-automatic fire. Proposal COM2015 (750) does not only concern owners of the real firearms we have been talking about so far. If this proposal goes through, then all air rifles, plastic toys which resemble firearms, air-soft guns, lighters in the shape of revolvers and even “mock-up rifles” carved from wood by a savvy child would be newly included into the so called “Category C – covering firearms subject to declaration and registration“. That means that if you have a BB gun from your granddad in the attic, a toy submachine gun in a children´s room, or revolver-shaped lighter in the desk drawer, you would have to immediately take such a “replica firearm” to the police and leave it there until you meet the requirements for a firearm licence. Afterwards, you could pay a stamp in the value of CZK 200.00 (in the Czech Republic) and receive a permit for that air gun, toy or lighter “firearms” to take them back home. But beware, every 5 years, you would have to bring them for inspection, and if the toy submachine gun ever gets broken, you would be under threat of heavy penalties when you throw it away, as you have to pay for a professional disposal and bureaucratic evidence! If some of these items, newly “subject to declaration and registration“ were left at your premises and you have ignored the new law, you would be guilty of committing the same crime of illegal acquisition and possession of firearms, as if you had a real, automatic Kalashnikov under your bed. You can be imprisoned for up to two years and may have some property confiscated. You might think that this cannot be true? That journalists are saying that this is just fabrication and fear-mongering? Well, it can be said that those respected journalists did not bother to read thoroughly the Proposal COM2015(750). (c) The paragraph 1 is added as follows: (...) 1h. For the purposes of this Directive, "replica firearms" shall mean objects that have the physical appearance of a firearm, but are manufactured in such a way that they cannot be converted to firing a shot or expelling a bullet or projectile by the action of a combustible propellant. This Directive, if adopted, speaks in very clear language. If something has the physical appearance of a firearm but is not expelling bullets or projectiles by the action of a combustible propellant, then now it is a “firearm replica“ – and suddenly, it is found in the Category C classification and all of those not having firearm licenses and possessing such a “replica“ would find themselves facing penalty custodial sentence. Do you still disagree? Let´s go through it. Lighters. If the lighter has “the appearance of a firearm“, then it meets the first section of said condition; and although its combustion is a “release of chemical energy“, it does not expel a projectile. Well, here it goes – “replica“, Category C and firearm license or prison. Plastic toy guns. You know them from the toy section of any supermarket. They are black with an orange tip and look like a submachine gun and when the trigger is squeezed they make an awful noise. But obviously they have “the appearance of a firearm“, they do not expel any projectiles, let alone by release of chemical energy… So no matter how absurd it is, under these new regulations, you would need a firearm licence, even for those toys. Without it, the possession of such a toy would be a criminal offence. Piece of wood. If you have a skilled child, they can carve “a rifle” from a piece of wood. Before air-soft replicas became so widespread, a lot of children were running in the woods with such rifles made from the pieces of planks of wood. But if the child is skilful and the result of their efforts with a saw and a rasp resembles a rifle more than a hockey-stick… Yes, you guessed it. “Appearance of a firearm“, nothing is expelled by chemical energy, category C and since a child cannot hold a firearms license or register a gun, automatically a criminal offence. It is definitely not a joke. Similar legislation has already been applied in the UK and Scotland. In Scotland, it is forbidden to possess any air gun without a special licence (and if someone has it, the Police could execute a house search without warrant at their discretion.In Britain, it is forbidden to possess any “replicas“, unless made in the bright pastel colours (orange, lime green…), but the authorities may graciously grant you an exception for getting an air-soft gun. The worst problem is the retroactivity of the proposal: moving any 'D'-category firearms into 'C' would imply that millions of Europeans have to notice such a legal change, bring their “replicas”, air-guns, blank-firing guns, etc. to the police, get a license, pay for it and register the until-recently-legal object resembling a gun and simultaneously not more lethal than a stick. Millions of people wouldn't go through such a nonsensical bureaucratical nightmare or wouldn't even be aware of it, thus making themselves criminals. Others might “get rid” of newly “offending” replica guns by selling them on the black market, to get at least something off of it. Yet, more people might decide that since everyone in Europe is now guilty of “unauthorised acquisition and possession of firearms”, why not get the real thing?